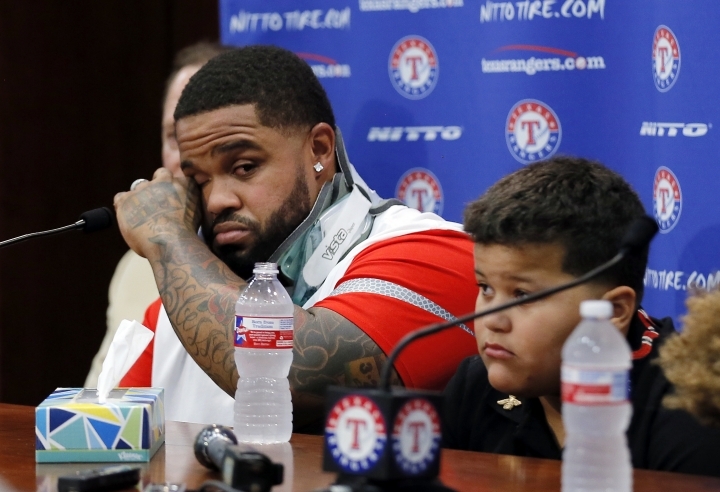 ARLINGTON, Texas — Still wearing a neck brace 12 days after a second cervical fusion, Prince Fielder wept Wednesday as he said health issues were forcing him to end his 12-season career in Major League Baseball. "To not be able to play, it's going to be tough," said Fielder, once one of the most durable players in the majors. His sons — one who turns 12 next week and the other 10 — sat with him at the podium, mostly with their heads down and also shedding tears. They have been regulars at the ballpark with their dad, much like he often was with his father, Cecil, a slugger who played 13 seasons for five teams. "The kids actually love baseball more than Prince. It was a sad moment," teammate Elvis Andrus said. "You rarely see him like that." All of Fielder's teammates, along with Texas Rangers coaches and staff, filled the interview room to support him. When the Rangers acquired him in November 2013, the first baseman had played at least 157 games every year since 2006, and appeared in 809 of 810 possible games the five seasons But Fielder was limited to 289 games in Texas because of two neck surgeries in just more than two years. "Even though I know I struggled personally this year, this was actually the most fun I've ever had and the best I've ever felt mentally about baseball," Fielder said. "That's the only thing that really hurts about not being able to play is that my brain was really good, with my body, just, you know, it just gave out." Fielder will finish his career with 319 career homers, the same number that his father had playing one more season but 141 fewer games. The only other father-son duo with more than 300 homers each is Bobby and Barry Bonds. Three weeks ago, Fielder had a scan on his neck injury, expecting a diagnosis that would see him spend maybe a few weeks on the disabled list. Instead, it showed a herniation between Fielder's C4 and C5 disks, just above where he first had surgery in May 2014. Doctors were already recommending that he quit playing before the second surgery July 29. Over 1,611 major league games with Milwaukee (2005-11), Detroit (2012-13) and Texas (2014-16), the burly Fielder was a six-time All-Star who hit .283 with 1,028 RBIs. Fielder said that when he gets the brace off — "This is killing me, this is terrible," he said — he will be back with the AL West leaders. "They've got work to do, I've got some cheerleading to do," Fielder said. "And hopefully win the World Series and pop the champagne."